My water bottle, travel mug, and workspace are all covered in podcast stickers. I love well-made podcast merch–and I don’t think making great podcast merch is difficult if you ask yourself the right questions. Most podcasters who make merch fit into one of two camps: they either slap their logo on a tee shirt and call it a day or get too overwhelmed by options and don’t move forward. I’m here to guide you through the five things you need to consider when making merch: your podcast, your audience, your designs, your niche, and why you want merch. With these five things in mind, you should be able to take the next step forward in giving your listeners great merch options for showing their support. This article was inspired by the “Turn Downloads into Dollars: Building a Lasting Audience Connection through Merchandise” panel at Podcast Movement 2018, thanks to the wealth of knowledge from James MacArthur, Sarah Rhea Werner, John Goforth, and Colt Cabana. While your podcast logo can potentially make for some great merch, think about what’s important about your podcast before just settling there. When fans think about your podcast, what do they remember? Some of my favorite podcast merch doesn’t have anything to do with their cover art or title. Instead, they come from quotes or ideas from the podcast that feel special. Girl In Space is a great example of thinking outside the box with what to put on your merch. Fans can buy shirts and more with “#NOMURDERING” on them, taken from a phrase that’s integral and memorable in the science fiction show. The McElroy brothers are also champions of this. They have a monthly enamel pin dedicated to an inside joke from the show, usually drawing from an especially funny quote or moment. What’s important about merch that shows highlights from your podcast instead of just its name is the sense of community and insider knowledge it brings to your fans. There’s something exciting and thrilling about a stranger seeing your shirt with an esoteric and recognizing it, and that’s a feeling most fans want to encourage with your merch. Before you think up the possibilities of your designs, think about what fans remember most about your show. Is it the title of a recurring subject? Is it an inside joke for your listeners? Is it a bold statement a host made? Is it an object, place, or character that plays a prominent role? All of those things could make for fantastic merch designs that will leave your fans feeling understood and excited. Different audiences have different needs, wants, and abilities when it comes to buying merch. While most podcasters think that tee shirts are the best bang for your buck in merch, many podcast fans would disagree. Tee shirts are great, but they cost about ten times the amount of a sticker or a button. To a fan who doesn’t just listen to your podcast but ten others–and most podcast fans do–that cost can creep up. One great method is just to ask your fans what they want to see in your merch and what they can afford. It might be disheartening to hear that many of your fans won’t pay more than about $20 in merchandise, but you’ll probably find at least ten more fans who will pay $2 in merchandise. Have you noticed your fans excited over another podcast’s specific kind of merch–say, for instance, buttons or enamel pins? That’s your audience showing you where you might want to put your planning. Luckily, there are sites like Tee Public where you can submit one design for multiple types of merchandise. What’s important to remember is not to dismiss the lower-price merch items in favor of the higher-price items. You might make more per sale, but you’re likely going to get fewer sales overall. Podcast logos and cover art images are made to be squares. Human torsos are, usually, not squares. Why try to make a square look nice floating around on a rectangle? When you think about the designs of your merch, you want something that’s going to fit the size and shape of what you’re designing. Hard, obvious lines usually make a shirt, a sweater, a tote bag, or other non-sticker/button merch items look strange and haphazard. It shows that you just uploaded a square image and expected it to work on everything instead of putting some effort into the design. Instead of just using your podcast’s logo or art, try taking individual important elements of it and putting them on a transparent background. This allows you to maintain brand identity but still put the image on different types of products in different colors. It also means no more harsh, obvious edges. Tee shirts, pins, bags, water bottles, notebooks, and stickers are all great. Fans love being able to show their love for your show in conventional ways. But think about what types of merch would make your show really stand out. Let’s take a look at the merch for Critical Role, a much-beloved Dungeons & Dragons actual play podcast and YouTube stream. Because these creators play D&D on their podcast, they didn’t just make shirts–they made custom dice. The Critical Role fan base is one that largely loves tabletop roleplaying games, and if TTRPG fans love anything, it’s owning way too many dice. Going back to the McElroys, their merch often includes things worn by their characters in The Adventure Zone, like a patch or a bracer. Being able to wear what the characters wear makes the listener feel like a part of the show. It also helps out their massive cosplay community. But that isn’t to say only actual play podcasts or audio fictions can make great innovative merch. What is your podcast’s niche? What do fans of that niche love, buy, and use other than typical podcast merch? If the reason you want to sell merch is to exponentially increase your revenue, you’re in for a sad surprise. Unless you’re one of the biggest podcasts in the industry, merch will likely not make you a significant amount of money. Because merch is expensive to make, it usually yields very little financial results. But that doesn’t mean merch isn’t worth it. While it might not make you rich in funds, it can make you rich in community. Owning merch makes a listener feel close to a podcast. Seeing someone own your merch should make you feel closer to them as a fan, too. Instead of focusing on the monetary benefits of the sale of a shirt, think about the engagement you could foster by retweeting someone talking about buying your tee shirt. Think about how their support will inspire others to listen. Merch will not fix all of your financial woes overnight. Instead, the prolonged effect of having an engaged community of listeners inspiring others to listen with their merch is more likely to benefit you over time. Instead of just slapping your logo on a tee shirt, think about what greater things you could be doing for your merch. Who is your audience? What makes them love your show? What do they want, and what can they afford? What could you be doing with your podcast merch that’s interesting and relevant to your niche? Could you be innovating more in what you offer? And why do you want merch in the first place? Are you planning to get rich, or are you panning to form a closer community with your listeners? Making great merch doesn’t have to be overwhelming, and your merch doesn’t have to be underwhelming. Keep these five things in mind, take a deep breath, and start planning the future of your new great podcast merch store. What’s Your Favorite Podcast Merch? Have you purchased any podcast merchandise you love? What was it, what show was it for, and what made you love it? Be sure to let us know in the comments below! Need More Help With Promotion & Growth? We’ve loads more tips and strategies to help you build your audience in our 30 Days of Audience Growth course inside The Podcast Host Academy. In there, you’ll get access to all our other courses too – from equipment and editing to voice training and monetization. 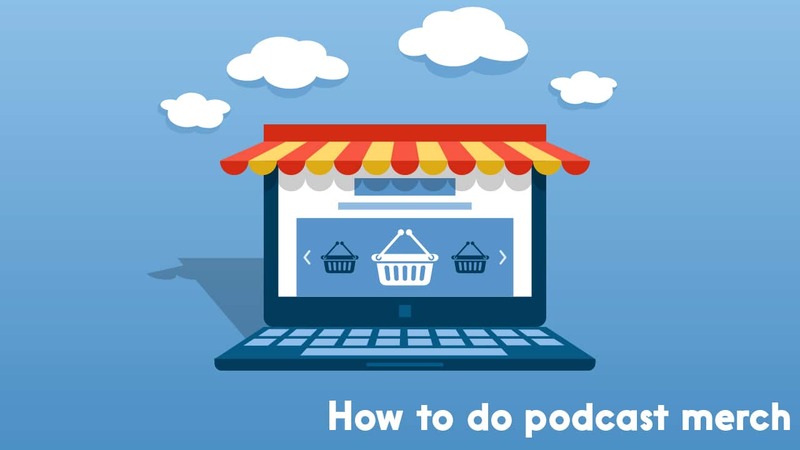 On top of that, we run regular live Q&A sessions where you can get tailored advice for your podcast, and solutions to your podcasting problems!